I loved the Big House (called the J. T. Roberts House but more properly known as the Wisenbaker-Wells-Roberts House). I felt such a great loss when it burned on January 26, 2011. The photographs in the Valdosta Daily Times showed flames leaping up in the air as they devoured the roof. A Valdosta Daily Times article on the day of the fire called the house a total loss. I couldn't believe it. In my mind, I pictured it being a pile of rubble once the fire was over. In 1997, I wrote a paper titled "Portrait of a Family" for the Local History class that I was taking at Valdosta State University. 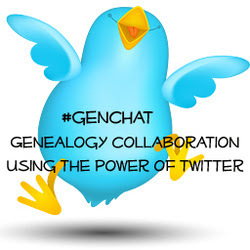 The majority of the paper is about the J. T. Roberts family (my maternal great grandfather) that I will share later, but the house, of course, is a prominent feature in my paper. Below in italics is what I wrote about the Big House. It's a bit "wind in the trees" kind of writing, but hey, it wasn't supposed to be a technical report. Keep in mind that this was written before the house was donated to the Valdosta Heritage Foundation (who worked for a number of years restoring it) by my Aunt Catherine and one of our cousins. They bought the house from the people who purchased it from the estate (that's a whole other story). Also, my Aunt Catherine has been tending the gardens since that time, so they are no longer overgrown as I state below. 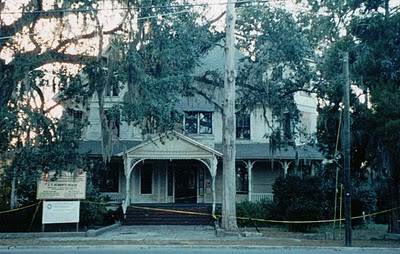 The large, white, two-story Victorian house at 206 Wells Street in Valdosta, Georgia, stands empty now after having passed from my mother's family's estate, the J. T. Roberts estate, to the hands of a stranger almost two years ago. 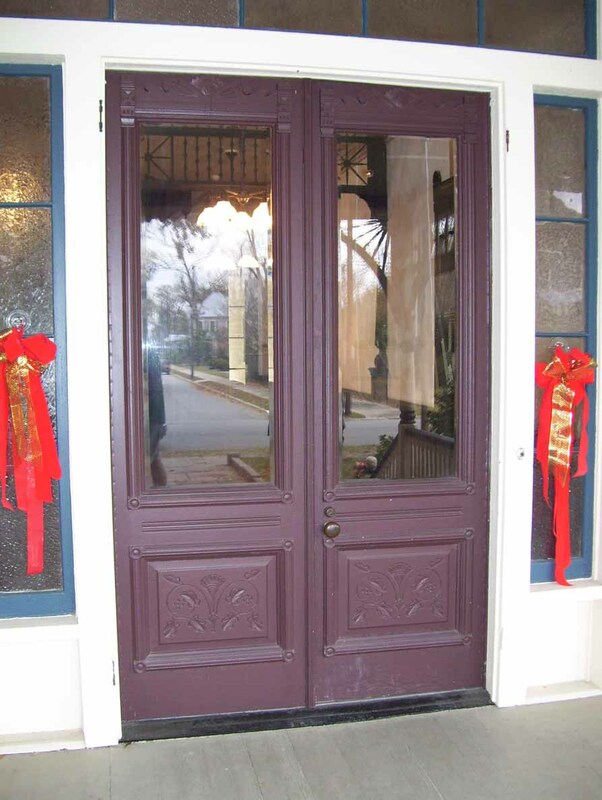 The Roberts family had continuously occupied the house for nearly one hundred years. Three generations had lived there, my mother's generation being the last. I had always been told that the house was older than Valdosta. We called it "the Big House" which is what it had been known as for years. Next door on the corner is my Great Aunt Kathleen Winn's house which is now owned by Harry Hamm. The Big House undergoing restoration, 2001. Sorry about the photograph quality. This is a scan of a 35mm photo. Red brick steps lead to the front porch which runs from one side of the Big House to the other. There used to be two porch swings and several rocking chairs on the porch. 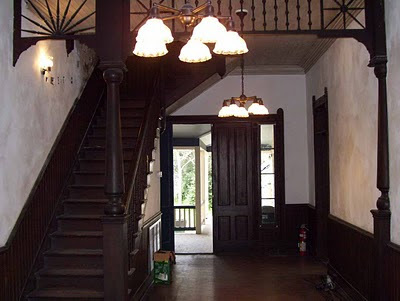 Through the double wooden doors is the large entrance hall which contains the staircase to the second floor. The front door to the Big House. Christmas 2008. The living room is on the left, and the parlor on the right. Past the parlor is the dining room and then the pantry. Passing through the pantry is the kitchen, which at the time the house was sold still had the old wood-burning stove. Through the side door of the kitchen is the back porch which can also be accessed from the entrance hall. I remember lots of flower pots and one or two broken chairs being on the back porch. Past the living room are two bedrooms and one bathroom. Upstairs are four bedrooms, two bathrooms, and the sleeping porch. The house had at one time gingerbread trim on the outside, and in a copy of an old photograph of the house, it looks as though the trim had been painted contrasting colors. In the entrance hall looking toward the back door to the porch beyond. Restoration had started on the interior. The original wall paper had been removed and new light fixtures installed. Christmas 2008. 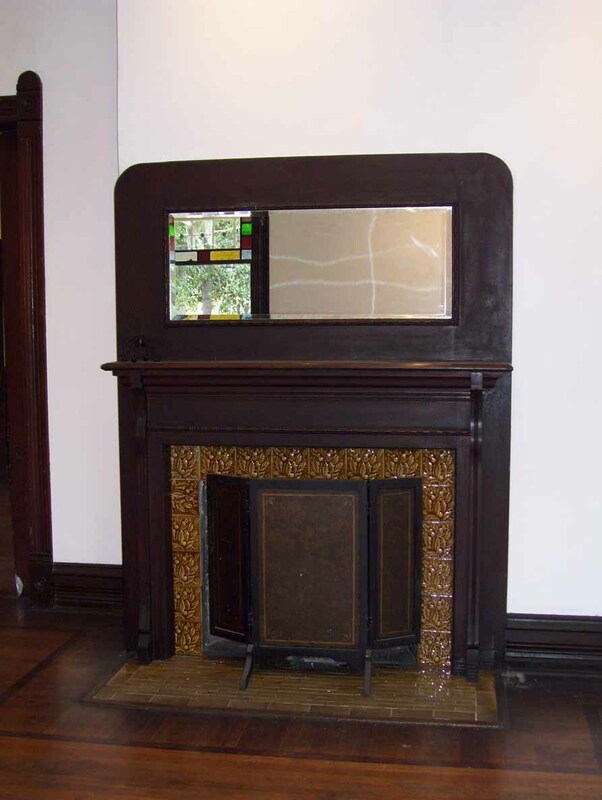 The parlor fireplace. You can see the stained glass of one of the windows reflected in the left hand side of the mirror above the fireplace. The parlor was no longer a dark and dreary place. Christmas 2008. As a child, the furnishings of the house seemed to to be be old, dark, and faded. Some of the furniture was Mission style, some Victorian. My great aunts and great uncle each had their special place to sit and you did not dare sit there. I remember sitting in Great Aunt Margaret's chair when I was about nine years old, waiting to have my picture taken with my new baby sister, Helen. I was so afraid that Aunt Margaret was going to come in and catch me in her seat. The woodwork in the house was stained a dark stain which had probably darkened even more over the years. The curtains and shades on the windows were faded and fragile, but the house had a comfortable, lived-in feeling, with loads of character and it gave me a sense of roots. There are extensive gardens surrounding the house, although they are now partially overgrown. There are camellia, azalea, cast iron, and liriopie plants, and camphor, chinaberry, and mimosa trees. There is a sycamore tree and some pecan trees in the back. In spring there are narcissi and snow drops. The remains of a potting shed are in the side garden. There was a lumber mill shop out back where cabinets were made and lumber was sold. My Great Uncle Redden Parramore kept bird dogs out back. There used to be an old barn where my grandmother, Leona Roberts Redles, kept my grandfather's military papers and letters in trunks. The old smoke house had been made into a play house for my mother, her sister, and their cousins, and this later became the pack house. 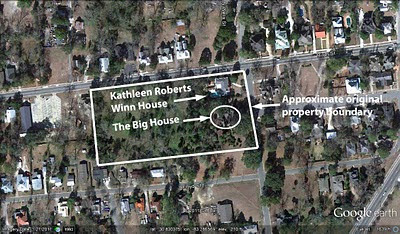 Google Earth aerial showing location of the Big House. I've drawn the approximate original property boundary which encompassed the land where the Kathleen Roberts Winn house is to the north. As children, my brothers, sisters, and cousins, and I would swing on the huge front porch swing while eavesdropping on the adult conversations through the tall windows of the living room. In the summer, the windows would be opened to let in the breezes and then we could hear the family gossip more clearly. Sometimes Great Uncle Bubba, Leland Roberts, would swing with us. He would tease us by telling us that we had better hope that the swing did not fall down, which, considering the age of the house, was probably true. My family went to the Big House every Christmas day for Christmas dinner and to exchange presents with cousins, great aunts, and great uncles. The Christmas tree was a "small" pine tree that touched the twelve foot ceiling of the living room with heaps of presents underneath. Cousin Warren Graham (usually known as "Brother") would perform the duty of Santa and pass out the presents to us. 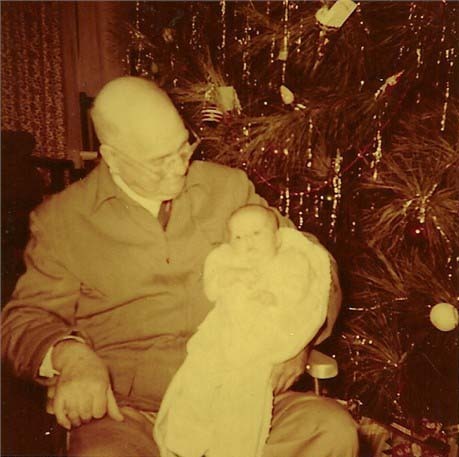 Great Uncle Bubba (Leland Roberts) and me, Christmas 1954. Notice the "small" pine tree on the right used as the Christmas tree. In the winter, there would be a coal-burning fire in the fireplace of the living room. There was no central heat until years later. I remember how cold the house was in winter. We would stand in front of the fireplace in the living room until our clothes were hot, and then we would run go sit down on our warmed clothes. We would sometimes sneak into the front parlor to bang on the old piano. The parlor seemed like the coldest, darkest room I had ever been in. My mother used to tell me about having to wear her fur coat in the winter just to talk on the phone in a nook under the staircase. On the other hand, the house was hot in summer, especially upstairs because of the metal roof. At night, I remember being told, some of the family would sleep in the screened-in sleeping porch on the second floor. As children, my siblings and cousins and I used to like to sit on the top stair of the staircase and slide on our bottoms to the bottom stair and onto the floor. We would do this until one of the adults, afraid we would hurt ourselves, would stop our fun. We were always reminded not to touch the staircase banister rail because some of the banisters were loose and had never been repaired. We would twist the banisters just to see. Every Easter we would go to the Big House for dinner after church. 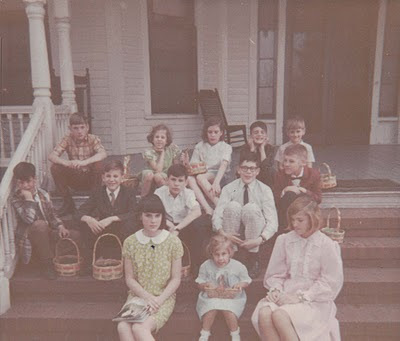 Then the afternoon would be spent hunting Easter eggs in the large side garden and having a group photo session on the front steps. 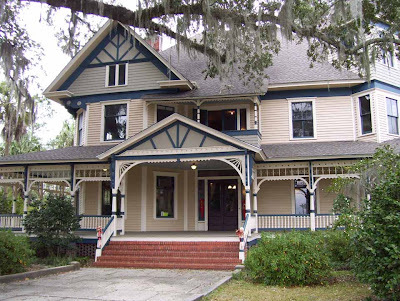 Afterwards, we would sit on the front porch in the heavy wooden rocking chairs or the porch swing and watch cars go by. Sometimes we would play in the field in the back of the house, chase the stray cats that lived under the house, or climb the big tree out back. We would pick up pecans or watch cousin Mary Remer Parramore work in her strawberry patch, our mouths watering at the sight of the "forbidden fruit." (We were not allowed to have a taste.) Great Aunt Midge, Edwina Roberts, would sometimes give us each a box of animal crackers as a special treat. My Great Aunt Midge wrote on the back of this photo "April 1968 Easter, Some of J. T. Roberts' great grandchildren." These are the Hart, Pendleton, and Smotherman children. I'm on the right in the pink outfit. Some of us don't look all that happy. It was hard to have to sit there waiting for our photo to be taken. I remember the smell of narcissus blossoms in the front entrance hall in early spring. Even now, the smell of narcissi brings back vivid memories of the times I spent at the Big House. I sometimes have dreams at night where I am back at the Big House. In some of my dreams, the rooms seem to sparkle with a light that I never saw there in my waking life. Other dreams are about ghosts, but in those dreams I am unafraid of them because they seem familiar and are part of the nuance of the house. To me, as a child, the house had seemed so old, huge, dusty, and dark, but yet had a peaceful feeling about it, like a good place to take sanctuary. It makes me sad that the house now sits uncared for and forlorn, like a forgotten elderly aunt. It appears that the new owner has not made any attempt at restoration, but then, neither did the Roberts family in the last few years they owned the house. Now the house is up for sale again. I would love to see the house brought back to her original magnificence as the grand lady of Fairview. The Valdosta Heritage Foundation worked very hard on restoring the house. The exterior was done first, and then the interior. They were nearly finished with the interior and were about to move into the house when it caught fire and burned. They have recently made the decision to restore the house yet again. The Big House after the exterior had been restored and painted and work had begun on the interior. Christmas 2008. In my next post about the Big House, I'll have a few before and after the fire photographs.